The Herpstat 6 features six probe & outlet jacks which are individually configurable. 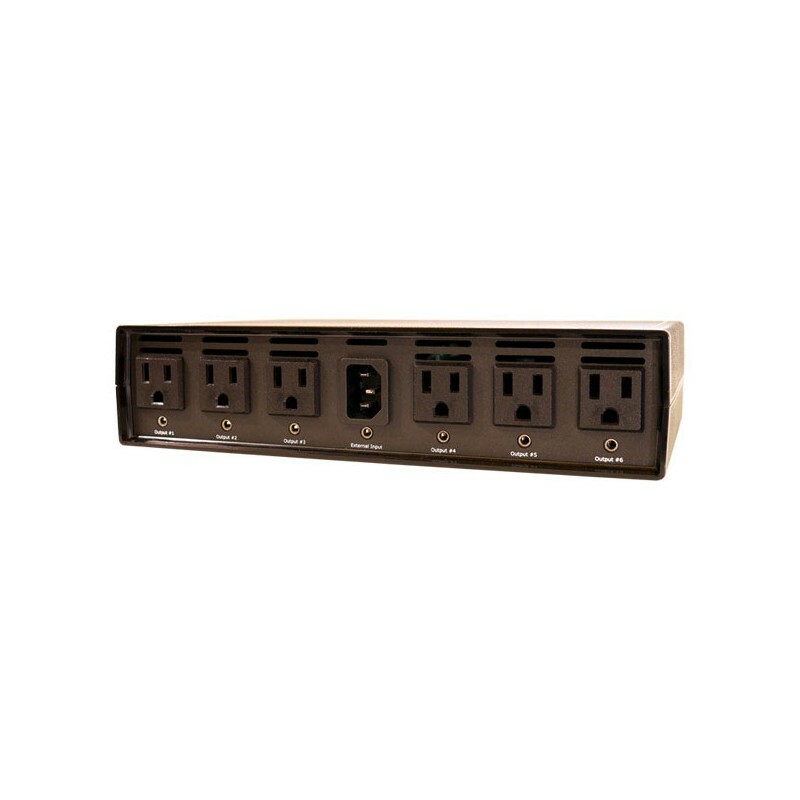 This unit features a built in mechanical relay that can be enabled to cut the power circuit to all six outlets in case a solid state component fails. Humidity control is also built into this device which can be as simple as timed misting sessions or full humidity control with our optional humidity sensor. 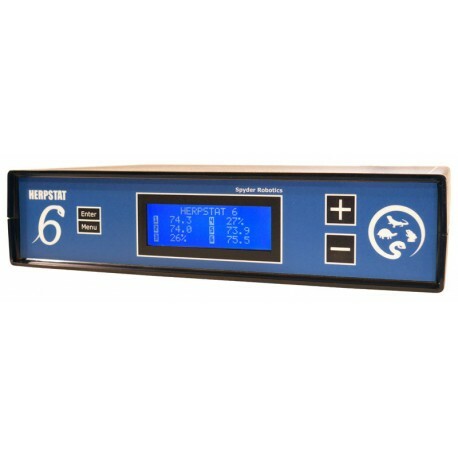 The Herpstat 6 vivarium controller is our latest design. It features six probe & outlet jacks which are individually configurable. This unit features a built in mechanical relay that can be enabled to cut the power circuit to all six outlets in case a solid state component fails. Humidity control is also built into this device which can be as simple as timed misting sessions or full humidity control with our optional humidity sensor. The soft startup feature slowly adds power on initial starts as well as a user selectable ramping between day and night time temperature settings. Light ramping to simulate sunrise/sunset is also built in. Our proven auto power matching algorithm constantly adjusts the power output to get the best regulation possible. High and low temperature tracking helps you monitor your enclosure temperature swing and also records the time and day of the event. Fanless control board for silent operation, Basking Assist mode that now provides compatibility with heating lamps as a heat source, both Dimming and Pulse proportional heating modes and a replacable power cord. 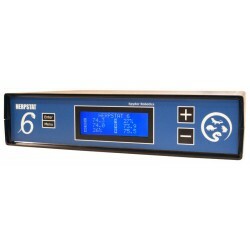 The Herpstat 6 comes with six temperature probes and power cord. Optional humidity sensing probes are available. ·Six grounded outlets capable of true proportional heating. ·Constantly monitors and adjusts amount of heat necessary to maintain a target temperature (Usable range from 40°F to 150°F or 4°C to 65°C). ·Outputs 1, 2, 5, 6 are configurable for Heating/Cooling/Lighting. Outputs 3 & 4 can be configured for Heating/Cooling/Humidity/Lighting with simulated sunrise/sunset and moonlight features. ·Humidity control with timed sessions or regulated with an optional sensor. ·Basking assist feature supports basking lights as a heat source. ·Safety Relay can disconect power to all four outlets if the an error exists. ·Soft startup slowly applies power during initial warmups. ·Night Drop feature built in with real time clock allows individual night drop settings for each output. ·Cooling function allows control of basic cooling devices. ·Individually selectable High / Low temperature threshold alarms. ·Removable sensors allow for easy replacement if necessary. ·Each output is fused separately keeping an outage on one output from affecting the other. ·375 Watt rating for each output (1800 watts total output) sufficient for most incubators, rack systems, enclosures, and vivariums.